As I mentioned in my previous post there is just enough space on the expansion header of the Sanguinololu for a derivative of the excellent PanelMax by tommyc. Tentatively named the “Panelolu” (which sounds like a sort of exotic icecream? ), it adds brightness and contrast pots for the LCD and a minimises the reset switch on the front panel. I have adapted the PanelMax Prusa enclosure and put it as a derivative on Thingiverse - http://www.thingiverse.com/thing:25617. 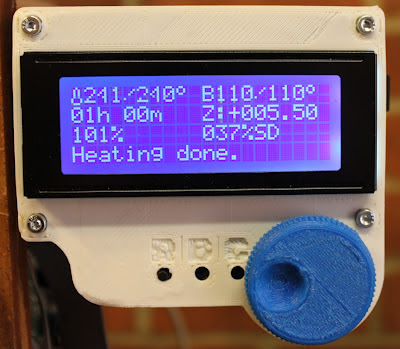 Currently the design is limited for a mounting solution for Prusa and other rod-frame based printers but alternative mounting solutions for other printers will be easy to add - I am working on a Mendel 90 version right now. Build instructions will be up soon and we will be supplying kits through eMakershop and ebay once we have put them together. You will need an ATMEGA 1284P, and Marlin firmware with the updates I described in my previous post for this to work. The wiring diagram and STLs for the right handed version are on Thingiverse, I will upload the SCAD and left handed STLs as soon as I have cleaned up the SCAD script - it needs some documentation! Off to take some pictures of the assembly process and write the build instructions. Update - more detailed post including build instructions here. What problems were you having with the hotends and did you get them sorted? I previously tried Marlin but was struggling to get the hot end to stabilise. It would heat up and then end up having a huge swing down from its set point (sometimes up to 20C below where is was set from!). Just wondering if you had a similar problem! Just recived a kit from you as well, so will be fitting that over the weekend!! So far no problems with temperature swings on Marlin at all - I have used the default PID settings for the hotend straight out the box so no doubt I could improve the response time by tuning them properly but I have not felt the need so its not migrated up the to-do list yet! My issues were partly due to some crappy filament, but mainly due to PTFE creep and distortion at higher speeds and temperatures. I have found hotends that print fine to slowly increase in extrusion force during a print to the point the filament strips - the hotends were not blocked (although in one case it was which threw me off the scent). Once cooled down and any after effects dealt with the hotends were generally fine but the problem would reoccur. This has happened with 4 different hotends designs, mainly with abs, with and without fans etc etc. I have not fully tied down exactly how best to deal with it but i am printing fine right now.